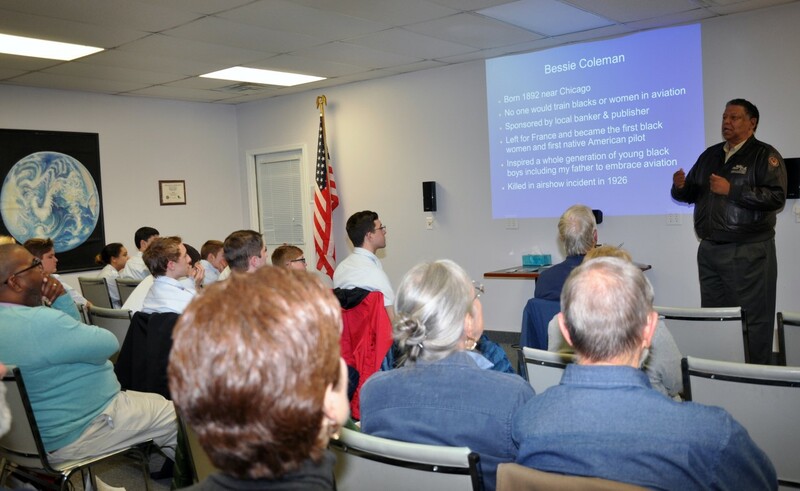 12/19/2017–MOCKSVILLE, NC–The Sugar Valley Composite Squadron welcomed Vernon Robinson on 5 Dec 2017 for the monthly speaker series. He shared with the squadron the rich history of African-American Aviators. As an applied military historian and the son of a Tuskegee Airman, Mr. Robinson had great stories to tell. Mr. Robinson graduated from the US Air Force Academy in 1977 and served as a Captain in the US Air Force. After leaving the Air Force, he moved to Winston-Salem and taught business administration at Winston-Salem State University. He continued his public service as a conservative political activist, candidate for US Congress, and a City Council member in Winston-Salem. He was also instrumental in getting charter legislation passed for the North Carolina Leadership Academy. Now he continues to be active as the president of Robinson Stratavision Consulting in Winston-Salem and also works with “RISE ABOVE,” an educational outreach program established to bring the legacy and history of the Tuskegee Airmen to communities and events. Mr. Robinson educated and inspired squadron members and visitors from the community with his presentation about the history and achievements of several early aviators: Eugene Bullard, Ahmed Ali, William Robinson Clarke, Domenico Mondelli, Bessie Coleman, Arthur Chin and Roger Sauvage. Since Mr. Robinson's father, two uncles and two aunts served with the Tuskegee Airmen, Mr. Robinson had some fascinating stories to share about the experiences of the Tuskegee Airmen during WWII. These aviators did not allow discrimination to prevent them from serving the U.S. during the war and performed with bravery and skill. The Tuskegee Airmen included pilots, navigators, bombardiers, maintenance and support staff, instructors, and all those who kept the planes flying. We salute these aviators for their contributions to our country and to aviation. Mr. Robinson also shared with us the efforts of the Commemorative Air Force’s Red Tail Project which was established to “inspire young people to overcome obstacles and achieve their goals using the example of the Tuskegee Airmen as a guide, honoring and remembering the service and sacrifice of these great American heroes.” The six guiding principles of RISE ABOVE are: Aim high, believe in yourself, use your brain, be ready to go, never quit, and expect to win.